I had a divine appointment today. A few times a year I make it a point to get away for a time of personal prayer and reflection. I usually have a plan for how to use that time away, on this mini retreat I was working on developing my Rule of Life. When I am on retreat like this I do everything I can so I am not disturbed, I try to keep my focus on hearing from God. While on vacation I got a chance to worship at one of my favorite churches, the First Baptist Church of Massena, NY. It is a small fellowship, the Sunday my family worshipped with them there were as many visitors (18 of us, all from out of town – I know that because we were all asked to stand and introduce ourselves) as “regular” attendees. I am not sure why God has used this place as an important place to participate in while I am on vacation. The sermons are okay, the worship is average, the people are friendly, it is really an average kind of place but for some reason it has a kind of spiritual draw for me. This Sunday they were hearing from a candidate to come and serve as their pastor. It was a good sermon, reminded me that I need to work harder to be a better husband and father than I am. I am reading “a Generous Orthodoxy” by Brian McLaren and some of the style, delivery and content of the message helped me to put some things in perspective, gave me some issues to wrestle with over the next few weeks. I also took away one or two sermon themes while listening. I like this church, the people there have a passion to serve God and for some reason God uses it as a kind of “centering” place for me. After service I went to speak to the worship leader and shared with him how special that church has been to me. I felt myself tearing up a little as I told him what it means to me to be able to come and worship with them every year or so. 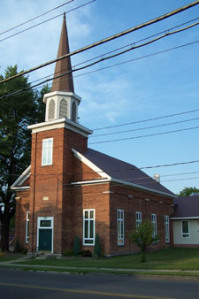 May First Baptist Church of Massena know the riches of walking in obedience to the call of God upon their fellowship. May they possess the confidence and faith that God can and will do great and mighty things for the Kingdom through their lives. May Church in the Acres be a place where people, even those who are just passing through, can come and be encouraged and uplifted in their walk with the Lord. Last night I participated in a group Lectio-Divina exercise. Lectio-Divina is the practice of reading the scriptures in a prayerful, meditative way, inviting the Spirit of God to speak to us through the word. It was originally a practice reserved for individual, private disciplines but over the past few years has become something practiced in small groups. I have always enjoyed the experience and am awed by the way God speaks to individuals through a set time of quiet and meditation. The passage we focused on last night was Psalm 143. In a number of places the author mentions enemies, “The enemy pursues me” (vs. 3); “Rescue me from my enemies” (vs. 9); “Silence my enemies” (vs. 12). Following our time of reflection and even into today I have had conversations about exactly who our enemies are, how Jesus invites us to respond to them. In the midst of this reflection on enemies I received an email in which Brian McLaren shares how God has used a “Prayer Regarding Critics and Enemies by Bishop Nikolai Velimirovic” to help him better understand the role of enemies in our lives and to help shape our Christ like response to them. I was deeply moved as I reflected on this mans experiences in life and the heart which motivated him to respond with grace, compassion and an openness to the leading and teaching of God. May we all respond to our ”enemies” in such a way. Growing up my faith tradition did little to recognize, in fact we seemed to ignore, the season of Lent. We had a great Easter morning celebration but everything leading up to Easter did not seem to be important. In recent years God has really worked in my life to help me see how much I was missing by focusing solely on the Easter morning celebration. Jesus spent forty days in the desert in a season of prayer and preparation before beginning his ministry. At the conclusion of those forty days was when Jesus was tested. Jesus was tempted to use the power that is his as the Son of God for personal gain rather than for the good of others. Jesus withstands that testing and after the time of prayer and fasting, and passing the test placed before him enters into his season of ministry. Observing Lent is one way that we, as Christians, can join Jesus on His retreat into the wilderness. Whether by prayer, fasting or reflection (or a combination of those) we can join with Jesus in seeking to know the will of God for our lives, counting the cost to see if we are willing to truly live as disciples of Jesus, and then go forth into mission and ministry. Lent is a time for somber reflection, self-examination and spiritual redirection. I have come to appreciate this season of the year. While it seems to be extremely busy it also provides a special focus on my spiritual health and my commitment to walk beside my Savior and Lord. May you find this Lenten Season to be a time rich with exploring in deeper ways the person and work of Jesus Christ.